At the end of the private conversation Socrates has with Hippocrates before both of them walk over to the house of Callias, Socrates presents a rather curious image: the soul is like a vessel (angeion) which is filled with the doctrines one learns (314a3–b4). The image is curious if one believes that knowledge or wisdom, according to Plato’s Socrates, is something that cannot be passed on to others like wares or commodities, a view expressed in both the Symposium (175d3–7) and the Republic (518b8–d1; see Manuwald 2006, 74). In the Protagoras, however, Socrates claims that doctrines, or mathêmata, that one learns from others, are like food and drink to the soul: they are the very stuff by which souls are nourished (313c8–9). Accordingly, one should take care that one does not end up consuming unsound doctrines that will prove harmful rather than beneficial to the soul. In particular, one should take great care if one intends to buy doctrines from a sophist, for the sophist is presumably, according to Socrates, like a merchant (emporos) or a hawker (kapêlos) selling food: just as hawkers and merchants praise all their wares equally regardless of their quality, it may be the case that the sophist, who praises all he sells, does not know whether his wares are beneficial or harmful (313d1–e2). In fact, as a rule, one knows which of the doctrines are actually nourishing and which are not if one happens to be a physician of the soul, Socrates claims – but if one is not, one might well be ignorant of this (313e2–3). Since Hippocrates is obviously no such expert, Socrates’ suggestion that he is about to put his soul into grave danger (313a1–2) is understandable. I wish to thank Hayden Ausland, Vivil Valvik Haraldsen and Kristin Sampson for reading earlier versions of the paper; they all contributed with many fruitful suggestions that improved the final manuscript. The present work was written as part of a postdoctoral research project financially supported by the Danish Council for Independent Research. Strauss, Leo. 1971. Plato’s Protagoras. A Course Given in the Spring Quarter 1965 at the Department of Political Science, Chicago. The references are to an unofficial transcript of recordings from the seminar. 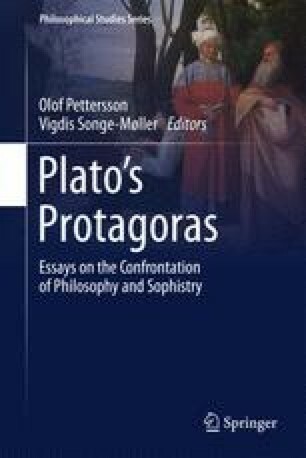 http://leostrausscenter.uchicago.edu/course/plato-protagoras-spring-quarter-1965. Accessed 19 May 2016.